What is Warrior Two Pose? Warrior two pose, or virabhadrasana B in Sanskrit, is a powerful standing yoga pose that builds strength and stamina. It's most often entered from warrior one pose by planting the back foot, rotating the torso and hips to the side, and stretching the arms in either direction. While it's a basic yoga pose, warrior two is used for all levels as it gives a deep stretch to the hips and greatly strengthens the legs. 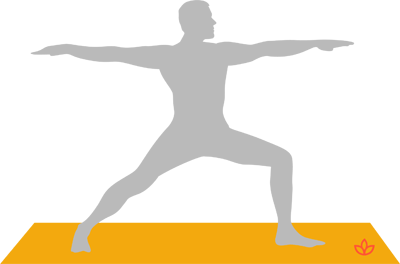 Begin in warrior one pose with the left foot forward. Lower the back heel to the floor and rotate the foot 90 degrees to the right. Keep the left knee over the left ankle. Rotate the hips and torso so they're facing right. Inhale and reach the hands out to the sides. Gaze over the left shoulder. Avoid if you have high blood pressure or recent hip, knee or shoulder injury.